On a good night for the Conservatives in Hertfordshire, the party retained control of Welwyn Hatfield Council despite losing two seats. Party sources before the count said it could lose overall control of the council but it now has 25 seats, Labour has 15 and the Lib Dems eight. In Watford, Peter Taylor, became the newly-elected Liberal Democrat mayor. He replaced fellow Lib Dem, Dorothy Thornhill, who stood down after serving for 16 years. At Welwyn Hatfield Council, the Tories lost two seats to the Lib Dems, which took a seat from Labour. Conservatives also retained control of St Albans and Broxbourne, where they also took the UKIP seat. Labour retained control in Stevenage but lost three seats. Elections took place in St Albans, Broxbourne, Welwyn Hatfield, Stevenage, Three Rivers, North Herts and Watford, which also had a mayoral election. In St Albans, where the Tories have controlled the council since 2015, the party lost a seat to the Lib Dems, which also took a seat from Labour. The Conservatives now have 30 seats, Labour has six and the Lib Dems have 19, with two independents and one Green councillor. The Hertfordshire County Council by-election saw Labour take St Albans North from the Lib Dems, with Roma Mills winning the seat ahead of Karen Young. It was up for grabs after Lib Dem councillor Charlotte Hogg decided to stand down. At Broxbourne Borough Council, where 10 seats were being defended, the Tories gained a seat from UKIP, giving them 28 seats on the council, with Labour unchanged on two and leaving UKIP with no representation. Labour has controlled Stevenage Borough Council since its creation as a non-metropolitan district in 1973 and this did not change after Thursday's poll, but it lost three seats, two to the Conservatives and one to the Lib Dems. One of the Conservatives' gains in Stevenage was won by two votes. In the Old Town ward, Tory Jody Hanafin won with 1,012 votes against the Labour Party's Monika Cherney-Craw with 1,010. The Labour Party now has 26 seats on the council, with the Tories on nine and the Lib Dems on four. At North Hertfordshire District Council, the Conservatives held onto control, winning eight seats but losing five. The Liberal Democrats gained three and Labour two seats. The Conservatives have 29 seats, Labour 14 and the Liberal Democrats six. The Liberal Democrats have taken leadership of Three Rivers Council after it being in no overall control. They had eight councillors elected compared to four for the Conservatives and one for Labour. 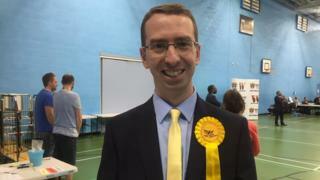 The Liberal Democrats has also kept control of Watford Borough Council, winning nine seats. Labour won three, but lost one seat to the Lib Dems. It means the Lib Dems now have 29 councillors compared to Labour's 10.